First off, lets think about the data model – how the data is represented on the server – and make some assumptions. How do we know that a clinician has ‘seen’ a patient? 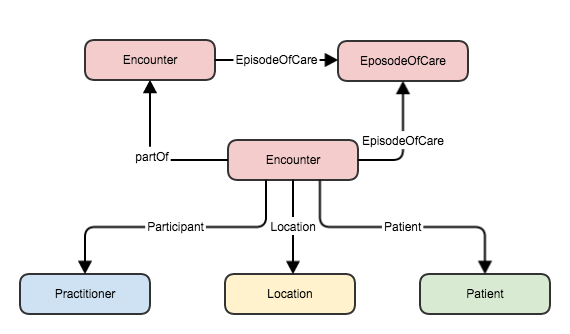 I’m going to go with the idea that every clinician/patient interaction generates an Encounter resource, which means that a single hospital visit will have many Encounters – perhaps grouped under an EpisodeOfCare or a parent Encounter (each individual encounter will refer back to its parent using the Encounter.partOf property). There are other ways we could do this, but it’s something to work with for now. Consultant. Encounter.participant.name as the participant is a reference to a Practitioner resource. You’d want to look at participant.type to get the consultant – as opposed to any other participants in this encounter. Now to think about what the queries are going to look like. To work through this, I used clinFHIR to generate some sample data for me. 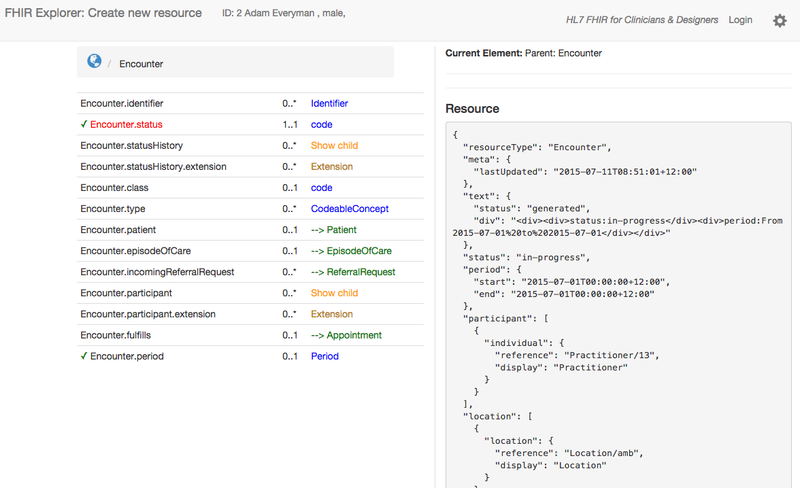 From the main menu of clinFHIR select the resource builder option, then one of the sample patients (or you could add a new patient or select any other existing one). Period. It’s important to set both start & end dates here, or the date search gets a bit wonky. (Here is where a profile would come in handy – this would enable you to specify that period is mandatory and both start & end are also required. ClinFHIR doesn’t support this level of detail – yet). Participant. This loads a ‘child’ set of properties – the one you want to set is individual – the type Practitioner seems most appropriate. When you do select this, you’ll find that there is a link on the right side called ‘Search for Resource’. Because we’re adding a reference to an existing resource we need to find it. Clicking on the link brings up a search screen (this is automatically generated from the server conformance resource) where we can enter our search criteria. There is a Practitioner with a name of ‘seven’, but you can select any one you want. Note that to return to the main part of the resource, click on the ‘encounter’ in the bread-crumb at the top of the list of list of properties. Location. This works in the same way as Participant as it’s also a complex reference to an external resource. Note how the search screen options have changed to suit the resource type. There aren’t many location resources, so just do a query with no filters and select any one. Note that clinFHIR automatically adds the patient reference for you. Oh, and if you’re part way through entering an encounter and want to create, say, a new Practitioner then clinFHIR supports ‘parking’ a partially completed resource. Just select the ‘Park Resource’ button at the lower right, then create your new Practitioner and save in the usual way. You can then retrieve the parked encounter from the toolbar at the top and continue on – the new practitioner can be found using the usual search. Here’s what the screen looks like after all the data has been entered. You can see the resource you’re building as you go. 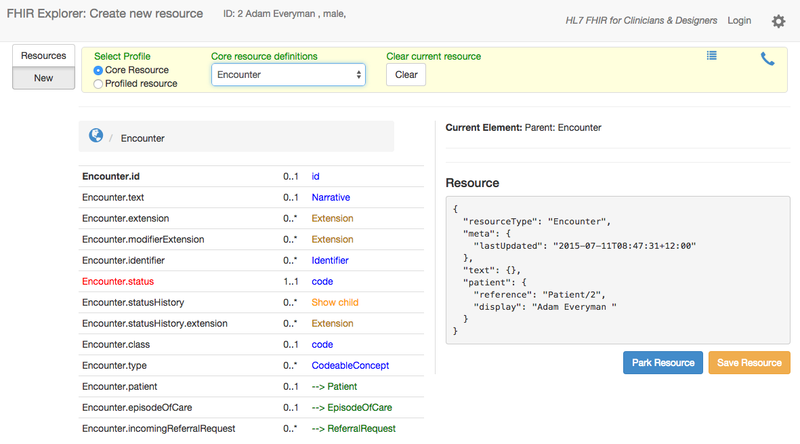 Once you’ve entered all the data, click ‘Save resource’ button at the lower right to save the resource to the server (actually Grahames server at http://fhir-dev.healthintersections.com.au/open/ ). You should get a confirmation that the resource has been saved – including the complete Url of the resource (I quite like to make a note of the Id – helps with finding things out later on, especially when things don’t quite work out as expected). You’ll probably want to create 2 or 3 encounters for different patients on the same date. So now that we have some sample data, how do we retrieve what we need? Well, here’s where a REST client comes in really handy. I use POSTman (there’s a description of using it here – but do note that this was on DSTU-1 so the details of FHIR have changed) but there are plenty of other options. Date searching can be tricky. Heres the link in the spec for more detail. And this is why we were careful to specify a beginning and end date in our encounter period. An ‘open’ period (start only) would be included in any date search after that – most confusing! Now the returned bundle also contains the Practitioner resources that the matching encounters refer to. Neat huh? Not all servers will support _include – as you can imagine it’s rather complex for a server to implement, but if not then you can always query for them directly. The servers conformance resource is where you can find out what aspects of _include – if any – a server supports. That will return all the encounters for a given participant Id – ie consultant. It pre-supposes that we know the id of the consultant (Practitioner) but that’s a simple thing to find out. Note that in the interest of clarity the other query parameters are not included here, but you can mix and match as much as you need to to refine your query. There’s more in the spec on filtering on referenced resources here, and on chaining (which allows you to step further into the referenced resource when filtering). Decide what your data model is going to be – at least a first cut. Use Postman to run sample queries against Grahames server (as that is where clinFHIR saves the resources) so you can see how it all works – and this might cause you to go back and change the model – iterative development is good. One thing we haven’t talked about here is profiling resources – especially extensions for data items you need that aren’t on the base resource. A topic for another post perhaps. FHIR and the associated tooling is now at the stage where the users of clinical systems – clinicians, admin staff and others – as well as business analysts can start to understand what it offers when it comes to recording and sharing clinical information, and to put their experience and knowledge back into the spec thereby making it even more fit for purpose. And finally, clinFHIR is very much a work in progress – there will be bugs and omissions so contact me if you come across anything weird.